Replace worn and corroded galvanized steel wire, formed wire, anchors, and pole line hardware with CLP stainless steel products and never replace them again. Dimensionally and functionally, CLP stainless steel products match the galvanized steel hardware you're familiar with except in one important way. 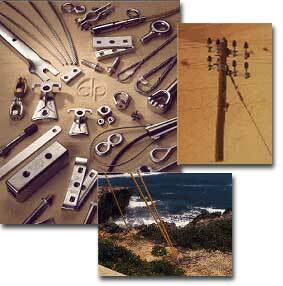 In most corrosive environments, CLP stainless steel pole line hardware lasts indefinitely. Put more than a half-century of experience on your next corrosive environmental challenge. From prototype to production runs, CLP satisfies even the most demanding customers with products manufactured under stringent quality standards. Material certifications, traceability and engineering assistance are available. Research and development facilities provide proof testing of products and assemblies. Click here for full catalog in pdf format (Adobe Acrobat).